Washington Nationals opened the 2008 season in their brand new stadium Nationals Park on a beautiful evening, night game, of March 30, 2008. Man what a game! with pomp and ceremony a very talented singer did a rendition of our National Anthem which would send a shiver up the spine of even the most hardened of skeptics for our country. President George W. Bush threw out the ceremonial first pitch. Our President did not do the customary toss of the ball from his box seat. George W. walked to the mound toed the pitching rubber and sent, "A high hard fast ball to the catcher behind the plate the Washington Nationals manager." "May God Bless America and Thank God For The Senators" "First in War First in Peace Last in the American League"
This particular game the inaugural, regular season official part of the playing season for record, event in the new Nationals Park had a most dramatic story book ending. Stay in suspense for the ending is at the end. A lot of it started back there in 1901 when the American League of professional baseball declared themselves open for business with the Washington Senators coming aboard in the new American League to join in the challenge of the National League. The Washington Senators and the Baltimore Orioles were two of the eight original franchise teams of the newly formed American League in 1901. It is only fitting that for the new "Nationals Park" in southwest Washington D.C. to be christened with an exhibition game between these two (relative) neighboring cities to open the brand new park. The Nationals Park, located in southwest Washington D.C., will be a place where D.C. City Councilman Tommy Wells of Ward 6 can look and talk about with much civic pride. This beautiful ball park being constructed with an investment in the range of $611 million has all the footprints of being a huge boost for the economic enhancement for the city and this area of the city in particular. The Lerner family, owners of the Washington Senators since 2006, in concert with councilman Tommy Wells are taking steps to ensure local neighborhood citizens have first dibs on job opportunities in support of the new park. Now with our new Nationals Park a reality, it is time to officially welcome back home our traveling nomads, the Washington Nationals. Professional major league baseball expansion all started in 1901 adding other cities, with new teams and the brand new American League. Changes happen sometimes for the best , even wanderlust and traveling about , but it is now back home to a brand new Park to call their own, the Washington Nationals can cast their anchor and call Nationals Park home sweet home. Baseball in Washington D.C. enjoyed cheers and jeers as the Senators. Time and circumstances led to the Senators leaving D.C. and heading to the west and found themselves reconstituted as the Minnesota Twins. Through these many years of professional baseball in our Nations Capitol there has been many storied records by the team and some of the teams players but by in large and the overall through the years historic record has not been so glorious. In the headlines of this page was a well known murmur and buzz which passed through out the major leagues during the years of professional baseball. 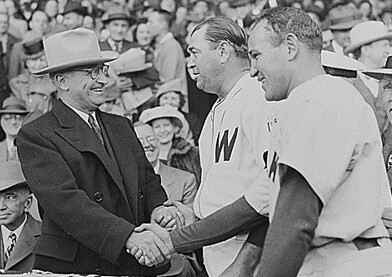 "May God Bless America and Thank God for the Washington Senators." Except for the very early years of play the club in Washington D.C. the Washington Senators were not known as contending world beaters as a rule. Later the Senators found new life back in Washington D.C. resuming their Senators heritage. Economics does not always play a fair game . As a result , our Senators were once again sold and became the Texas Rangers. Washington D.C. had a vacant neighborhood diamond , while the Minnesota folks had a team. Ironically when they returned home their stay was short-stopped and to the Lone Star State of Texas they roamed. Our corral in Washington D.C. was empty again until the Montreal Expos determined Washington D.C. was the place where they belonged. Thanks, Montreal for giving us back our baseball team. The Montreal Expos packed their bats, spikes and winning attitude and came south back to where they belong, right here in Washington D.C. New start, with the Washington Nationals new owners and a new Nationals Park with everything working together. I would think Councilman Wells and the Lerner Family are beaming with pride. The Washington Nationals initiated their new stadium with an exhibition game with the Baltimore Orioles enjoying a 3-0 win March 29, 2008. Tonight March 30, 2008 sees the inaugural opening season game with the Atlanta Braves with Tim Hudson an Auburn University alumni doing the hurling for Atlanta. President George W. Bush will throw out the ceremonial first pitch at this brand new $611 million dollar Nationals Park. Washington Nationals won the inaugural opening game in their brand new Nationals Park with a walk off home run by No. 11 Ryan Zimmerman the third baseman in the bottom of the ninth inning and the Nationals won this historic game 3-2 over the Atlanta Braves. What a finish for the jubilant Nationals in their new Nationals Park opening game March 30, 2008. Ball players of the early years were heard to murmur, "THANK GOD FOR AMERICA AND THE SENATORS."